Organic farming systems are often nutrient-limited. Moreover, even if organic guidelines emphasize the reliance on ecological processes and recycling, the trend towards farm specialisation induces an increased reliance on off-farm fertilising materials in arable areas. There is, therefore, a need to better understand the drivers of nutrient inflows on organic farms. Our objectives were to assess the nitrogen (N,) phosphorus (P) and potassium (K) farm-gate inflows through fertilising materials, and the nutrient budget and use efficiency over a large range of organic farming systems. To do this, 56 interviews with organic farmers concerning their nutrient management for the years 2010 and 2011 were carried out in 2012 in three French agricultural districts distributed over a gradient of farming activity. The results showed that the farm-gate fertilising material inflows were strongly related to both the ratio of land under cereal and oilseed crops (proxy of nutrient ‘demand’) and the stocking rate (proxy of nutrient ‘supply’). However, other inflows (biological N fixation, feed use, fodders and straws) increased with the stocking rate, leading to low farm-gate N and K use efficiency (0.2 and 0.7, respectively) on livestock farms compared to arable, stockless farms (1.4 and 3.5, respectively). 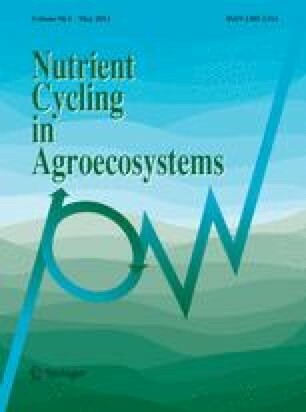 Such results helped to disentangle the drivers of nutrient use in organic farms compared to previous analyses based solely on farm production typology. We are grateful to the 56 farmers who were interviewed, to Gail Wagman for improving the English, and to two anonymous reviewers for their many comments. Benjamin Nowak’s PhD was funded by Bordeaux Sciences Agro (Université de Bordeaux) and INRA, Department of Environment and Agronomy. Additional funding was provided by INRA AgriBio3 and ANR DynRurABio grants.